This series is becoming something of an exercise in masochism for some readers; we've jabbed red-hot pokers into the eyes of Volvo fans and cheese-gratered the hearts of Mercedes-Benz lovers. How about a vintage Toyota? Some More Salt In The Wounds For You Amazon Lovers! Looks like a rust-free car with a straight body, and the original 2T-C is still reasonably complete. 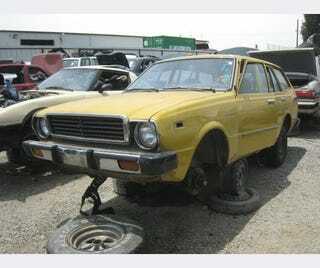 It appears that Malaise Era Corolla coupes mostly avoid the fate of this car nowadays, but I suspect it will be a few more years before Japanese wagons start to get much attention from restorers and/or racers.